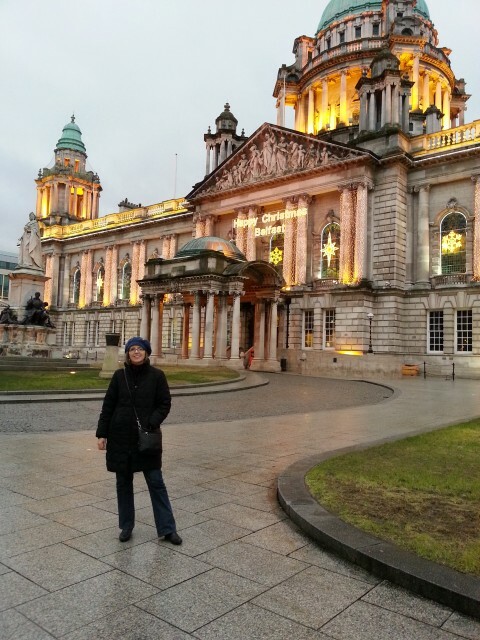 Here’s your Poet Laureate in front of the City Hall in Belfast, Northern Ireland, on January 2nd, the night before our return to the US and just two days before political riots broke out again in this beautiful but embattled city. At this moment, all was calm and well, Irish. My husband Frank and I went from here to a bookstore, to a pub for a pint, and then to a wonderful seafood restaurant. After a memorable meal we walked to a small dinner theater to hear an Irish country singer, Maria Doyle Kennedy, accompanied by her amazing guitarist husband, Kieran. Why did she look so familiar? She looks sooo familiar, I said to Frank. When we got home, a little google research revealed why: Maria Doyle Kennedy, the most evil character(to date) on Downton Abbey! Well, read the poem yourself and let me know what you think. What a surprise to find both the evil and the grand in Northern Ireland. A beautiful poem. The last two lines tug at our hearts. Maria Doyle Kennedy made a good evil surprise…she is a wonderful singer. Very moving. Thanks, Richard. I found out that lots of Scots(including myself) are Scots Irish meaning the British drove the Irish out of the farms and some went to Scotland, so that’s half of half and half more! But Burns sounds pretty unshakably Scottish. Thank you for sharing your adventure and the beautiful poem, Sally. It simply made me cry. My kids just left for school (18 and 19 years old), and I don’t know about “worse partings,” but it is a fresh parting, and it hurts. Fresh is so painful. Yes, it’s a good poem for that too. Hang in there. I really loved this. Thank you for sharing. Thanks for commenting, Joanne. Happy New Year. Hope to see you in it. I need to turn this in tomorrow, so i hope you check your PLblog often…. … and you loved Maria Doyle Kennedy in The Committments. Unfortunately, I am completely unaware of The Commitments, but thanks for filling out her background. I’d forgotten about the Commitments!!! Sally, it’s a must see!! !